Celebrate Always: Best Day Ever! A few Fridays ago will be one of those days that I will never ever forget. I still can't get over it! Ok! So first I will start with the back story. As you know, I love the Ellen Show. I had written to her a few times before. I wrote in for Bob's birthday during his year of 37, sent her the doghouse video (makes me cry from laughing every time), and a bad Santa pic that Brittany sent in and that Ellen actually posted on her instagram in December! About a month ago I was watching Ellen and saw the "Sorry it's Ari" clip. I was cracking up! At the end of the clip, Ellen said if you have anything you need help with around the house then let her know and they will send Ari anywhere. Since we are about to move (more on that at the end of this post), I wrote in saying that Ari could come help us pack. I told them that we have two girls, lots of baby dolls and that we just love to have fun. I was subbing in Ella's class on a Friday and it was 1:00. I had my phone in my back pocket and I felt it ringing. I pulled it out to see who was calling and it said Northern Los Angeles Area! My immediate thought was The Ellen Show. I went to answer it but I missed the call! I couldn't believe it! I went into a slight panic mode while trying to keep cool in a room full of 6 year olds. I called back the number and as I was doing that, they called me back again! I clicked over and answered. There was another mom helping me sub that day so I mouthed to her that it was the Ellen show so I stepped outside on the phone while she watched the kids. It was only a 4 minute conversation but I will never forget it. I was shaking, covered in red spots and couldn't even think straight. (obviously I was made to be on tv) It was someone that worked with The Ellen show and she said that she read my email and it was just protocol to call and get some more info. I was giddy. She asked a little bit about my girls and Bob, where we lived, where Bob worked, what I would do it Ellen called me, how long and why we watch Ellen and what I did. I'm not great put on the spot so I was pretty basic and said stuff like "I just feel like Ellen is my best friend!" I'm sure they think I'm crazy. When she asked what I did, my answer was "nothing." I mean, could I make myself sound any more boring?! I was so mad I didn't say that my best friend and I make and design our own shirts! 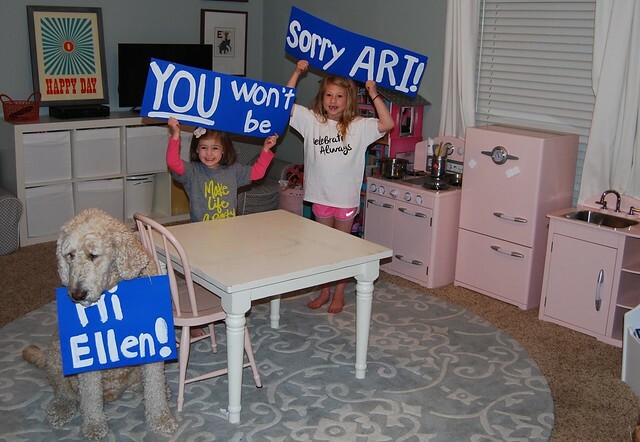 The girls were so excited and still ask when Ari is coming over. I'm not sure if it will go any further from here but I wanted to give it one more shot so I just sent in this picture today. Fingers crossed they call again and it really happens! How crazy would that be?! I don't think I have officially made the announcement that Bob got a job in the DFW area and we are moving in June! We are beyond excited to be moving back closer to family and friends but so sad to leave all the wonderful ones here. It will be a bittersweet move. Our house went on the market last week so that's exciting! Beds are made every morning now which is a new thing for us but I'm kinda loving it! PS guess who else might be moving to Texas?! Oh How exciting! Oh How sad. I didn't know about this latest news of moving. Keep on blogging. You are the coolest mom. February, why do you have two R's?